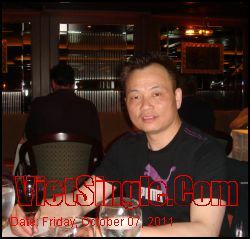 My goal: I am looking for some one that we can get alone to get married,have a wonderful and happy family. Free Time: I love to travel and eat,do some things healthy for life. I Am: I am nguoi viet ngoc hoa,I was born in Viet-Nam.I cam to America early 80,I can speak fluent in cantoness,mandarin,English as well as Viet-Namesee. Looking For: I am looking for people understand and know how to enjoy life with me.